June 29, 2016, Oakland, Calif. — California’s ongoing drought has wide-reaching impacts, from how we grow crops to the price of electricity. Often overlooked is its impact on disadvantaged communities. The Pacific Institute and The Environmental Justice Coalition for Water (EJCW) conducted community-based participatory research with eight Bay Area community-based groups to explore and document the drought’s impacts on low-income people in the San Francisco Bay Area. 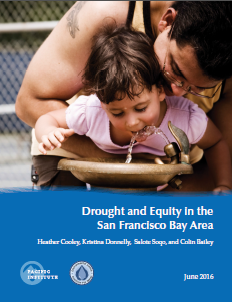 Through a series of collaborative meetings, surveys, and in-depth analyses of data, the group produced a groundbreaking report that sheds light on specific drought-related hardships faced by low-income residents and offers recommendations for mitigating those impacts. The project team examined available data on drought impacts for the Bay Area, such as the number of households without water. The group identified affordability and water infrastructure conditions as key concerns for low-income communities, along with inequitable water use, whereby wealthier households typically use more water than lower income households. These are persistent concerns in many communities but have been exacerbated by the drought. During a drought, for example, water utilities may enact surcharges to purchase emergency water sources or to recover revenues lost through reductions in water use. These surcharges are needed to maintain the economic viability of the water utility; however, they may exacerbate affordability concerns for low- or fixed-income households.